The Dunleath neighborhood and historic district is a vibrant and welcoming community that sits on the northeast edge of downtown Greensboro. Formerly known as Aycock Historic District, the neighborhood was listed on the National Register of Historic Places in 1993. The neighborhood had its beginnings in the late 19th and early 20th century when textile magnet Ceasar Cone graded and paved Summit Avenue, a boulevard that connected downtown Greensboro to Cone’s manufacturing facilities. The neighborhood’s central location to downtown and the Cone mills made it a desirable location for city residents, who built large homes in Queen Anne styles with turrets, porches laced with brackets and spindles, and elaborate window shapes. 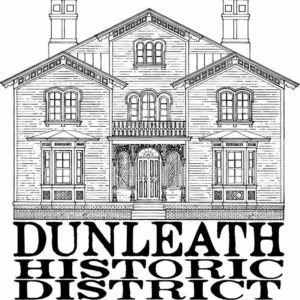 Homes in Dunleath were mostly built between the 1890s and 1930s and include classic Queen Anne, Colonial Revival, American Foursquare, and bungalow/American Craftsman-style architecture. Nearly all houses in the district share wide front porches, mature trees, and generous floor plans. The neighborhood features sidewalks, a playground area, a community garden, and close proximity to Greensboro’s growing downtown. Home prices range anywhere from the $70s to high-$200s and $300s. Dunleath is a diverse community and is home to many local artists and designers. The Dunleath Neighborhood Association is very involved with the local middle school, Swann Middle School. They also hold several community events including a neighborhood cookout and its annual Dunleath Porchfest, a family-friendly event in which the community is invited to enjoy the beauty and hospitality of the Historic Dunleath Neighborhood while enjoying the richness of performing artists from the community. Neighbors offer their porches as performance venues, and performers from throughout the area share their talents in a festival-like atmosphere that also includes food vendors and children’s activities. The neighborhood is also home to World War Memorial Stadium, one of the nation’s oldest surviving stadiums, the Greensboro Farmer’s Curb Market, the Sternberger Artists Center, Sternberger Park, and the soon-to-be completed Downtown Greenway. Click the apply button to see all the homes for sale in Dunleath- to see this search full screen, Click Here!